UPDATE: We're up to 40 members now and growing so hop aboard! Thanks to everyone who's responded so far. computer screen with an iPhone. Not good! 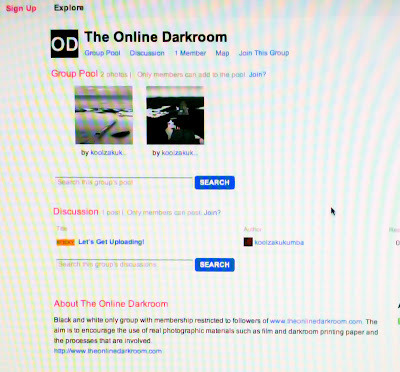 A while back, I had the idea of setting up The Online Darkroom Flickr group where people who follow the blog can post examples of the kind of work they're doing themselves. That would let me see what you're all up to and what your fellow followers are doing. The idea is that the group would become a two-way street as opposed to the one-way street that a blog almost inevitably has to be (with the notable exceptions of much-valued contributions from Omar and Phil). In the group "sticky" I've said, "I thought it would be nice to have more of a two-way exchange so please feel free to upload your favourite film-based black and white work to the group pool. 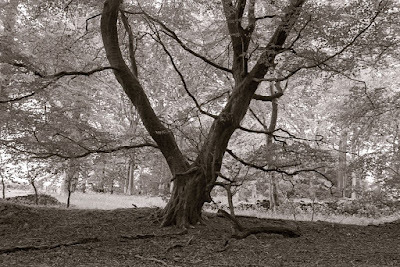 Negative scans are OK but scans of actual darkroom prints are even better. Uploads are limited to two a day to keep the pool to a manageable size." So please take this post as your invitation to join the group. I decided to limit the uploads in case there are some machine gun shooters out there who might be tempted to upload 30 pics a day. It's probably much less likely where film photographers are concerned but some Flickr groups have such big photo pools that some of the pics may never be viewed by anyone. I quite fancied the idea of restricting membership to followers of this blog but I don't think that's really possible. Put it this way, if you're not a follower and don't want to join (it's a free country) you'll not be turned away. I called it "my" group in the post title but I hope it becomes "our" group. So don't be shy. I really don't want to be the only member of my own group! An interesting post,Bruce. The filmwriter seems like an interesting device; however except for those photographers who happen to have one, printing digital to OHP-type materials and contact printing in the darkroom is another option; I had planned to try this out but it's on hold as my Epson printer decided that being two years old was too old and decided to fall apart. I did think of trying the digital negative route but it's quite complex working out the adjustment curve and I never got round to it. Plus, the recommended OHP film (can't remember what is was now) never seemed to be available in the UK. Good luck if you decide to give it a bash.